ASL teachers – John Smithis, Matt Kish, Arlene Duff, Annabel Smith, Jenny Seeds and Lesley Leo visited Nirvana School this February to volunteer their time for a week during their winter break. Everyone had a great time during the visit and took away a lot of fond memories. During their stay, the teachers taught the kids English conversation, handwriting and sports and helped out in other classes. They also held a workshop for the teachers and they took the kids on a field trip to the beach. They also brought over new Sports uniforms for each student, donated by ASL. 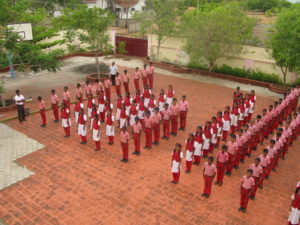 The uniforms were presented to the kids on the teachers’ second last day at the school during the morning assembly. The kids love their new uniforms and proudly wore them on their annual Sports Day on February 26. The ASL teachers also visited a nearby government school where they donated stationary and other school supplies. Nirvana School students, teachers and staff would like to thank the ASL teachers for graciously donating their vacation time to assist us for a week and for the wonderful gifts they brought with them. Currently they are assisting Jenem Cards, a greeting-card company started by former Nirvana students Elumalai, Jeeva and Selvam. The cards are hand-painted by current Nirvana students and 30% of the profits on the sale of the cards go towards helping the school. One Cause is currently creating the Jenem Cards website.